Welcome to the Gentil Sport Taupo Classic 2013. 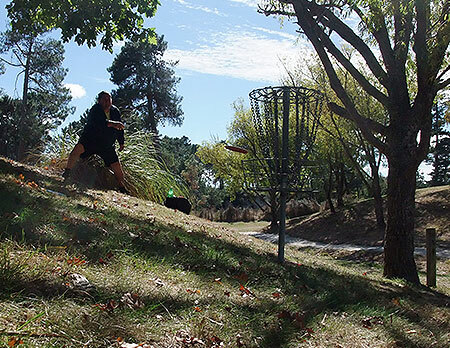 Spa Park turned on the heat on both accounts this weekend when 45 keen disc golfers immersed themselves in one of New Zealand’s most beautiful parks for The 9th annual ‘Gentil Sport Taupo Classic’ which doubled as the 60 point Major ‘North Island Championships’. A massive thanks to Blair Joines and Pete Boyle and The Lost Tribe for bringing baskets over from Taumarunui and helping set up the course along with the Mexican legend simply known as Juan Unda. 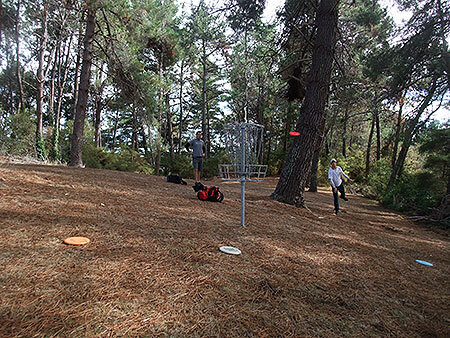 Here’s hoping they won’t be required for the 2014 Taupo Classic, with the council watching this year’s event closely and sounding keen to see a permanent course in this beautiful park. 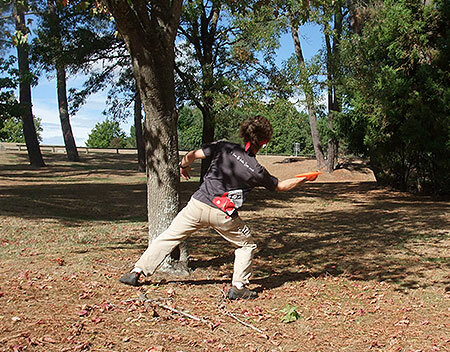 MTB Careful - Complete with a mountainbike track/cart path along the fairway, he tricky hole #1 on the Spa Park course caused some headaches. Most of the usual suspects were there plus some new additions, always a welcome sight and the return of some old faces that were excellent to see again. Special Mention to the travelling crew from Wanaka & Canterbury of Martin Galley, Robyn Agnew & Chris Davies, lest we forget the highlighter yellow and regular Tourman that is Wellington’s Brady Keuch. 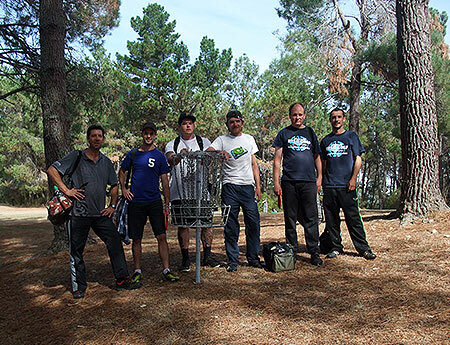 It must be said that it’s fantastic to see the tour numbers increasing at every event and the momentum that the sport is generating, which is certainly a good sign for Disc Golf in New Zealand. After the mornings round the combatants had many emotions written across their faces, with mixed stories to boot. 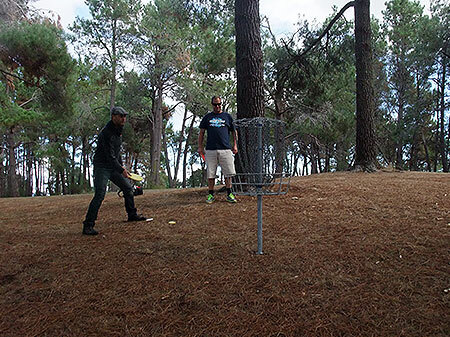 One who was smiling was David Keene , who managed to take a two shot lead heading into the afternoon round from the New Zealand Disc Golf Champion Simon Feasey ( 52) followed one shot behind by Blair Joines (53) leading the Masters. With the weather being so amazing it made the course play quite differently than in years gone by with fast greens and unforgiving rollers, the score cards were not immune to the numbers 5, 6 or even 7. Gemma Sullivan had put herself at the front of the woman’s field with an impressive opening round, also putting himself right in the mix of the top group was Waiheke Island’s Siep Van Vliet with a solid 54. 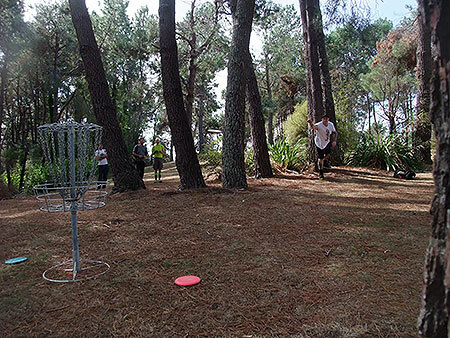 Thanks to the sponsors Gentil Sport and www.discgolf.co.nz for putting on a putting competition during the lunch break, giving everyone a chance at winning some new plastic, with newcomer to the tour Jacob ‘chainsaw’ Corcoran taking out the prize. So off into the sun the players went again to attack the course in an attempt to get back the shots they’d left out there in the morning. While the second round scores rolled in to be counted up not much had changed at the top, with Simon Feasey (104) closing the gap to just one shot behind first round leader David Keene (103), Jackson Sullivan made a move with another solid round to put him in the top group for Sunday on a (111) while a few of the usual top group contenders had found the pace a little tough, Damien Peters & Brad Muir had work to do if they saw themselves making the Sunday afternoon ‘Super 6’. So as the clocks were wound back to NZ Standard time over night, the thought was how would that effect the players body clocks come Sunday morning? Well the extra hour sleep worked for Simon Feasey, as it’s not often he goes in overnight in the chasing pack. Sunday morning he came out firing shooting a weekend best 49 to take his place at the top of the field while the extra hours sleep seemed to work in the opposite fashion for overnight leader David Keene. 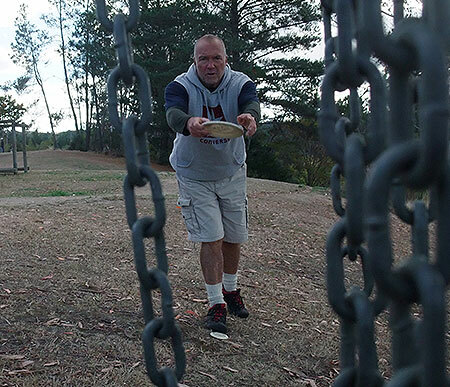 Keene watched as the lead rolled its way down the perilous’ hill on hole 4 leaving a 6 on the scorecard and putting the Fease firmly in the driver's seat. It’s a lead that he would not relinquish for the rest of the round to put one had on the Taupo Classic & North Island Championship silverware. Blair Joines had an impressive round 3 also shooting a 53 on his way to taking out the Masters title. While fighting tooth and nail to make sure Des Cooper didn’t get the better of him was Pete Boyle who eventually got there and to keep Des’s first GM title illusively out of reach. Across in the Woman’s division Gemma Sullivan increased her lead on the chasing 4 woman with some amazing shots and three solid rounds over the weekend with Toby Gentil cleaning up in the Junior Division again with his golf improving at each outing. Chris Davies from Christchurch also made his trip worth his while in the Sunday morning round with a skip ACE on the 17th to scoop the $513 that had accumulated in the ACE Kitty. Good skills! 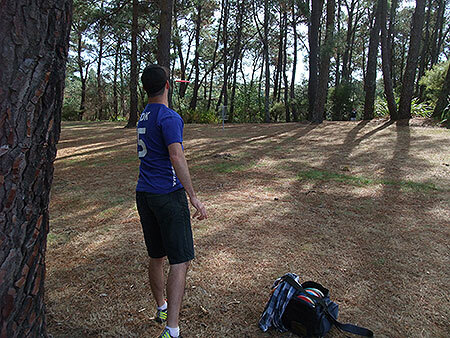 So after another fun Innova closest to the Pin competition it was back to the course for the ‘Super 6’, for the first time in a number of years without a GM in the mix. For 2013 the Super 6 was Simon Feasey (O), David Keene (O), Blair Joines (M), Jackson Sullivan (O), Siep Van Vliet (M) & making an amazing late run to get there was Damien Peters (O) with four birdies in his last 5 holes of regular play to sneak in by a single shot. With David Keene having to at least attempt to put the pressure on Simon the mistakes started to creep into his game allowing Blair Joines to close the gap on second. By the third hole Keene had to attempt a birdie putt to keep his slim hopes alive, however turning the birdie into a bogey was not in the plan and invited Blair to set his sights on second place. There was still everything to play for as Siep was hunting Jackson down and not giving up anything was Damien Peters who had the luxury of knowing he had nothing to lose, as last man into the Super 6, as he applied the pressure to the five players in front of him. When the dust settled Simon Feasey had increased his lead to 10 to take the Open and Championship title, Blair Joines closed the gap on David Keene to tie for second overall and take the Masters title. 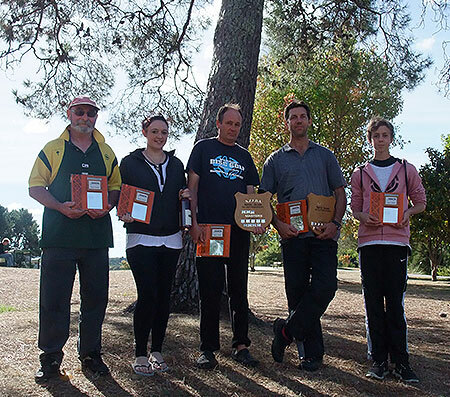 Gemma Sullivan took out the Woman’s title, Pete Boyle Grand Masters, Jenny Joynt the Woman’s GM, Toby Gentil the Junior 18 title and the Open Rookie title went to Rotorua local Logan Papuni. Congratulations to everyone who made this another great event. AB, see - Abraham Hartley from Levin’s Brotherhood Club giving it all he’s got on the tee of the 160metre 5th. 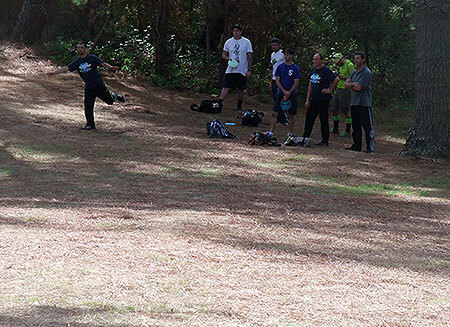 Tokoroa's Finest: Jumping Jenny - Woman’s Grand Masters Champ Jenny Joynt from Tokoroa slipping her second between the trees on the tight 13th as Rotorua‘s Michael Grondsma and Waiheke‘s Malcolm McMartin watch on. 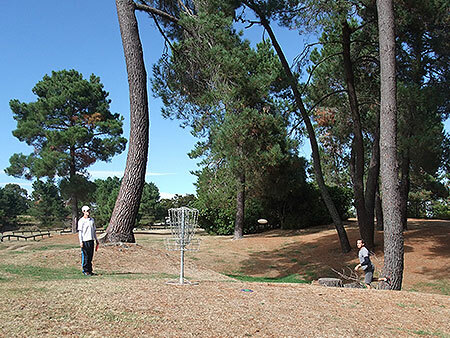 West Coast Flick - Californian golfer currently residing in Taupo, Ethan Raabe putts 17 watched by Chris Davies and Martin Galley - the hole Chris would ACE for $513 on the Sunday morning. Spinal Straddle - Wanaka Disc Golfer Martin Galley suffered from a bad back all weekend but still played some great golf..
Class at Last - A big gallery followed the ‘Super 6’ and witnessed some great Disc Golf. Southern Skills - Two of the 3 South Islanders who made the trip, Wanaka’s Martin Galley putting with Chris Davies from Christchurch watching on. 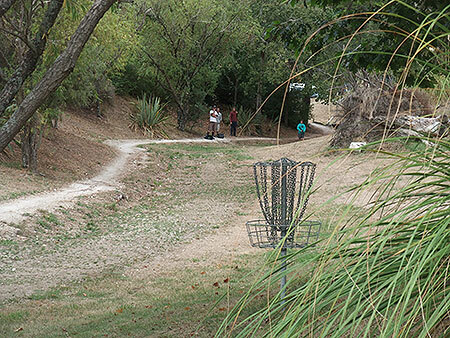 Holy Smoke - Chris Davies hoping like heck that his up shot doesn’t roll the 80plus metres to the bottom of the hill on the dreaded hole #4. No points for guessing this guy’s from Northern California. Ethan Raabe solidly putts for par of the par 4 5th. 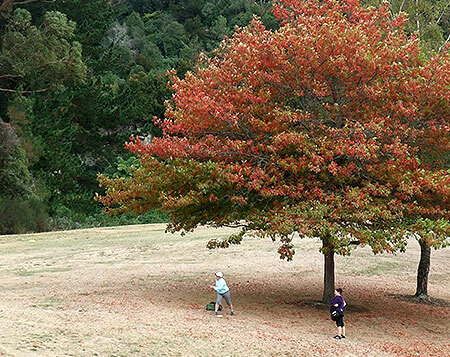 Leftie Lurch - See the great Autumn weather as Auckland’s Brad Muir shoots up to basket 16 with playing partner Leroy Windle looking on. Super - The 2013 Taupo ‘Super 6’. Simon Feasey, David Keene, Jackson Sullivan, Siep Van Vliet, Blair Joines and Damian Peters. Dilemma - David ‘Speedo’ Keene stuck between a rock and a hard place. Should he go for it for a chance at the Championship or cover to protect second. Champions - The 2013 Taupo & North Island Champions. Pete Boyle GM, Gemma Sullivan Woman’s, Blair Joines Masters, Simon Feasey Open and Toby Gentil Juniors. Missing are Jenny Joynt Woman’s GM and Logan Papuni Open Rookie. Pretty Sight - Jenny Joynt’s up-shot on 10 watched by playing partner Gemma Sullivan and the beautiful Autumn colours of Spa Park. 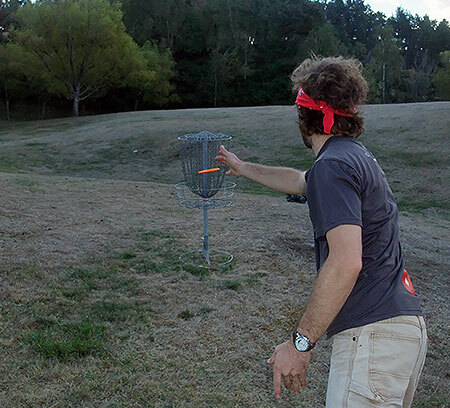 US Force - Nor Cal’s Eathan Raabe now living in Taupo and loving the Spa Park course.. The Chains Grasshopper - Pick a link and ‘hit it’. Don’t even think about the big hill behind the basket. 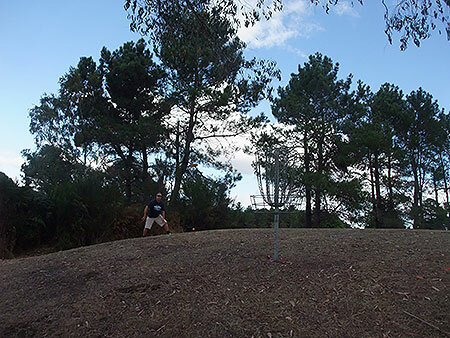 Travelling Putt - Back from Adventures in the Far East, Waiheke Island’s Leroy Windle shoots back at basket 12 as playing partner Brad Muir looks on. Nice Par Pa - Levin Brotherhood Chieftan and father of leading golfers Jacko & Gemma, Shane Sullivan happy to be slotting a 3 on the tricky hole #1. Leading Action - Having to work hard to make the Super 6, Auckland golfer Damion Peters justified his inclusion with some sweet throws..
Samurai Jack - With skills reminiscent of his namesake, Levin’s Jackson Sullivan impressing the big gallery as the Super 6 take on the 6 extra holes.